Few writing groups have flourished as mightily as the Dedicated Writers Society, Chippewa Falls' premier writing group. The group describes its vibe as "warm and welcoming, supportive and constructive," which seems to be the perfect conditions for a thriving community of writers. Over the past year, three of its members, Jackie McManus (author of The Earth Mover’s Daughter , Connie Russell (Happily Ever After), and Everin Houkom (author of Crazy Music and Daddy Didn’t Come Home) have published new works. Read on for a Q&A with the group members. Tell us about your writing group. How did it begin? Can you describe the meetings? 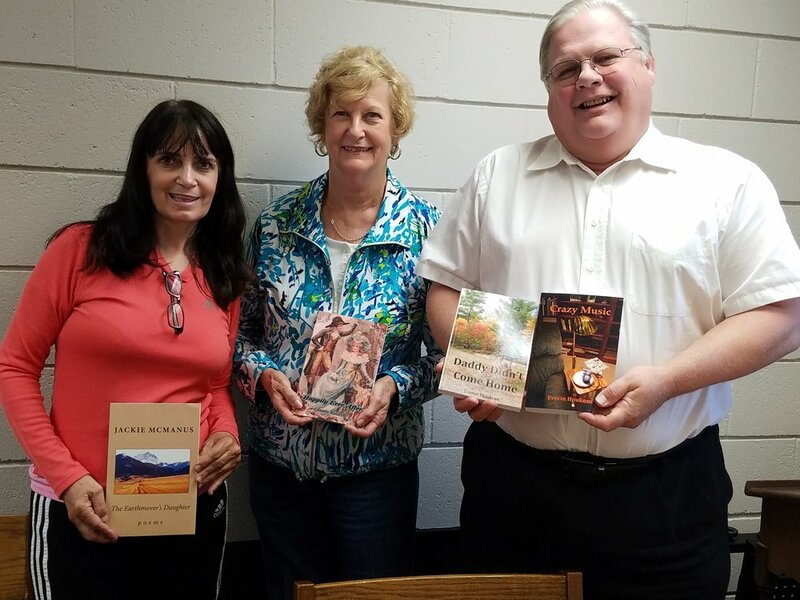 Connie: After a book talk by BJ Hollars, a discussion I had with him and Joe Niese, Chippewa Falls Public Library director, led me to think we might try a writing group at the library. We meet from 6:00 to 8:00 p.m. the fourth Monday of each month. Ev: One reason it’s successful is that Connie sees that everyone has a chance to read and respond. We also welcome anyone who would like to attend. Connie: I keep my eye on the clock, but so far everyone respects the others’ time. If there is time before 8 o’clock, a person can take a second turn if they have more they would like to share. People come and go, but there are about six of us who come regularly, and we trust each other to be honest but supportive. How has the group helped you grow as a writer? Ev: We were tentative at first, but we’ve evolved. Jackie: As a poet I thought at first I might not come back. People said they didn’t understand my poetry, and they couldn’t give feedback because as writers of prose, they were unsure how to critique poetry. But I came back, and they have been helpful and are trying. Ev: I’ve gained confidence as a writer here and at Cirenaica. Connie: Me too, and knowing we’re meeting on a regular basis keeps me writing. Ev: With my first book, I didn’t know how much to bring. My second book went better. I’ve gained confidence. For more information on the group (and other regional writing groups! ), check out our directory here.